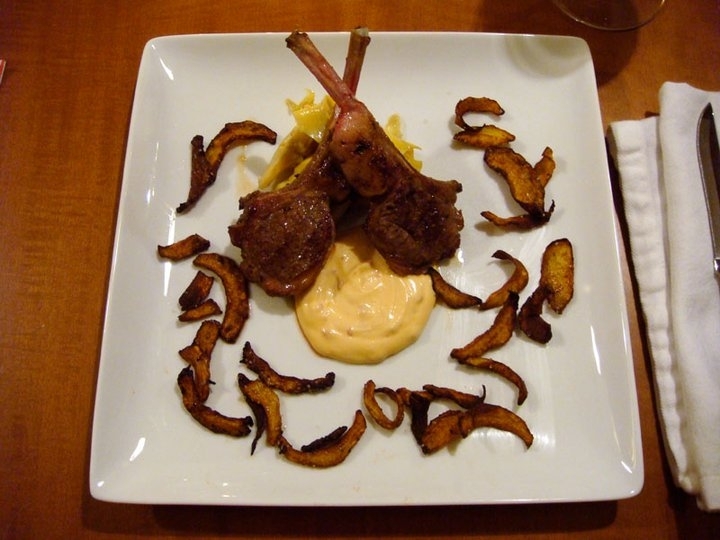 Crispy Lamb Chop with Artichoke Two Ways — Top Chef All-Stars Night | Eat.Drink.Life.Love. Split into teams. Each team gets lamb and artichokes. Do something creative with them…go! Top Chef All-Stars Stephen, Tre, Spike and Richard Blais (our personal fave to win) got all Quickfire up in there with a crispy lamb chop and artichoke three ways … which translated into only two ways on the Bravotv.com recipe. Evidently, Chad the Bravo intern who is frantically writing this stuff down as he’s watching the show can’t count. In any case, K bought a big ol’ rack of lamb since we can never find bone-in lamb chops that aren’t tiny, if we can find them at all. I’ve never cut lamb chops out of a rack before so I guessed and tried to cut close to the bone on one side, leaving as much meat as possible on the other side. If anyone knows the proper way to do this, let me know! After breaking down the rack of lamb (and freezing, for later, what we weren’t going to eat that day) I gave it a good rub down with salt and garam masala and let it sit while I started on the braised artichokes. A few months ago, using Stewart Woodman’s “Shefzilla” cookbook, we made carrot curry scallops with artichokes and used fresh artichokes. While INCREDIBLY delicious, this experience taught me that fresh artichokes are often difficult to find, expensive, a big mess, very hard to break down and, ultimately, not worth the work because you can get the hearts and the bottoms in bottles and cans (just clap your hands … sorry). This is why we went with canned artichoke hearts and bottoms for this recipe and will forever going forward. K attempted to cut the artichoke bottoms on the mandoline for the artichoke chips, but they weren’t cutting properly (too wet). I am aware this is a limitation of the canned/bottled artichoke, but he cleverly found a way around the problem by simply cutting the artichokes thinly with a knife. Ha! After slicing them, he started frying them up and liberally salted the artichoke chips as they were pulled out of the oil. We were out of mirin, so I combined half rice wine vinegar with half sake, melted some butter with it in a sauce pan and popped in some artichoke hearts to simmer. When the “mirin” butter had reduced, I threw in a little water and garlic. K and I put together some mayo, fish sauce, some Sriracha chili sauce and lime juice for the sambal mayo and then he was suddenly on the last batch of artichoke chips to fry. I put the lamb chops in a saute pan, tried to get them as medium as possible and zip…we were done. The lamb was juicy and unctuous and well-seasoned (though not particularly crispy, maybe I didn’t sear them on high enough heat). The artichoke chips were crunchy and salty and a little bitter, but the sautéed artichokes were tender and sweet and a bit tart. The sambal mayo gave all of the components a smooth, spicy finish, but each in a different way. We were dying to find out what the “third way” of the artichoke we were missing out on! If you’ve got a glut of artichokes on hand and a rack of lamb, this meal is highly recommended. Word of warning: Frying artichokes leaves a scary black film on the side of the pot you’re frying in. It will require soaking and scrubbing, but hey…they’re fried artichokes. Deal with the dishes later and just enjoy.